Do you like dividends or buybacks? Two of the larger telecommunications companies not named Verizon or AT&T are Charter Communications (NASDAQ:CHTR) and CenturyLink (NYSE:CTL). Both Charter and CenturyLink have undergone large, transformative mergers in the past couple of years. And in the midst of the recent market sell-off, shares of both companies are trading near their 52-week lows. While there is much that sets Charter and CenturyLink apart, both offer a mixture of broadband, cable, and phone services. These two companies carry a bit more risk than the other two telecom giants, but also have potentially much more upside. Which one is the best fit for you? Just a few years ago, Charter Communications was a regional cable company, and CenturyLink was a struggling regional telecom operator. But oh, how times have changed. Charter was purchased by cable mogul John Malone and other investors in 2013 after the company filed for bankruptcy in 2009. In 2016, the "new" Charter purchased both Bright House Communications and Time Warner Cable, creating the second-largest cable company in the country behind Comcast. Meanwhile, CenturyLink, which had already achieved significant domestic scale through acquisitions in the early 2000s, made its largest acquisition ever in 2017, buying Level 3 Communications. This was really a merger of equals, and Level 3 expanded CenturyLink's footprint within the U.S. and also gave it a foothold in international markets. Charter and CenturyLink are pursuing different strategies. Charter has consolidated both of its acquisitions into the new Spectrum brand, focusing on delivering high-speed internet and cable packages to consumers. Meanwhile, after the Level 3 acquisition, CenturyLink mostly focuses on the enterprise market, pursuing high-revenue corporate customers. Yet there is also plenty of overlap between the two companies' services. Charter continues to push its Spectrum business commercial offerings, while CenturyLink has been looking to improve its consumer business (which accounts for roughly 23% of its revenue), offering cable customers "Price for Life," as it boosts speeds in its more rural footprint. Still, CenturyLink seems to be pulling back from its consumer business. It no longer offers its own cable package, instead selling AT&T's DirectTV satellite service. This is likely because CenturyLink doesn't have the scale to negotiate with powerful media companies. By contrast, Charter is not only looking to improve its own cable packages, but just unveiled its own branded mobile offering (licensing part of the Verizon network to do so). Both companies are also combating some headwinds. Currently, investors appear to be worried about the effect of cord-cutting, especially on Charter's consumer-oriented business. Charter maintains that the cable bundle isn't incredibly profitable anyway, and that its new two-way set top box offering should arrest the decline in video customers. Packaging cable with broadband and its new mobile service should help, the company maintains. Meanwhile, CenturyLink has large, declining legacy offerings in business services, such as landline phones and other copper-based products (as opposed to the newer fiber-optic services). So, even though CenturyLink is becoming much more profitable than in the past, and newer products are growing, its overall top line is still declining. 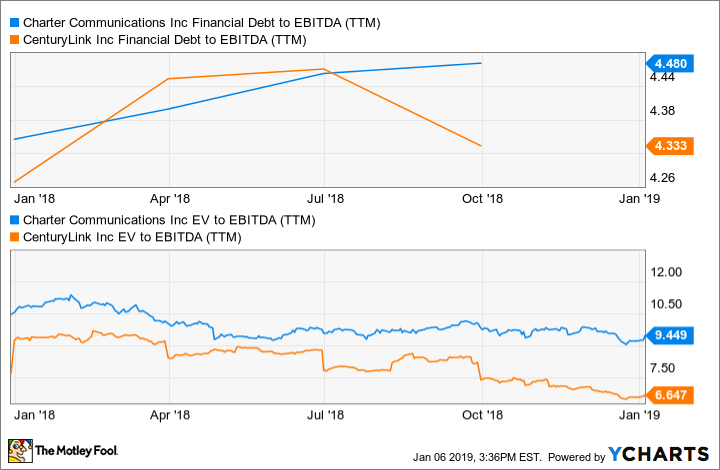 The market clearly does not like shrinking revenue, and has given the company a very low valuation, with an EV-to-EBITDA ratio of just 6.6 (compared to Charter's EV-to-EBITDA of over nine). Add to this relatively high debt loads (each has a debt-to-EBITDA ratio of over four), and you have a recipe for market skepticism. Charter Communications vs. CenturyLink Leverage and Valuation, data by YCharts. Despite high debt and transformation costs, Charter and CenturyLink are still returning cash to shareholders -- but in different ways. Charter has never had a dividend in its recent history, using much of its operating cash flow to integrate Bright House and Time Warner into an all-digital, uniform national footprint. Whatever is left over is being returned to shareholders via share repurchases. In the two years since the acquisition, the company has repurchased 17.8% of its total shares outstanding. CenturyLink, by contrast, has historically paid a high dividend, and continues to do so. After the recent sell-off, CenturyLink's dividend yield now stands at a huge 14%, even though the dividend appears to be well covered by this year's cash flow. Still, the market appears to be skeptical about the future of that payout, and will be until the company's revenue line starts to go in the opposite direction. So which stock is right for you? It depends. Charter appears to be the less risky investment, but should CenturyLink work through its transformation under highly-touted CEO Jeff Storey, it could offer much more upside. So I think both are compelling, and deciding which is for you depends on what kind of investor you are. Those reaching for upside and high yield should go for CenturyLink, while the more risk-averse should lean toward Charter's steadier business. Check out the latest CenturyLink and Charter Communications earnings call transcripts.